Over five weeks this spring, Susanna Sullivan ran four races. A nation-leading 26:51 at the St. Patrick’s Day 8k. A week later, second at Virginia Beach’s Shamrock Half Marathon in 1:14:22. 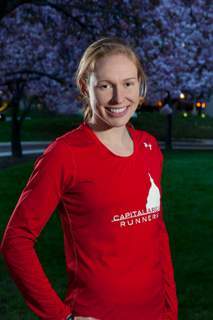 After a break, second at the Collegiate Running Association championships at Richmond’s Monument Avenue 10k with a 33:42, a pace she nearly matched eight days later en route to a 54:31 finish at the Cherry Blossom Ten Mile, fourth place in the U.S. 10 mile championship race. Two years ago, that would have been unthinkable. Not the times, but running two races, let alone four, in five weeks. But it didn’t happen, and now she has a race on her calendar more than a just few weeks away — Feb. 13, 2016 in Los Angeles— the U.S. Olympic Marathon Trials. Her time at Shamrock — the race she thought was the worst in that stretch — won her an invitation, and as she approaches two years since her post-collegiate running career began, she’s enjoying training consistency she hadn’t known since she left for Notre Dame. Following her successful career at George Mason High School, she had every reason to expect dramatic improvement. While her times did improve, it wasn’t a smooth ride. As injuries invariably followed her good training weeks, she broadened her life away from the track so that the times she’d be forced from it wouldn’t be as distressing. With a few months to go before graduation, a broken foot sidelined her for most of her last semester, but the way she answered set the stage for her future. “I figured I could mope around with a broken foot and wear a boot at graduation, or see what I could do,” she said. Sullivan put in several hours a day in the pool and the Alter-G treadmill, working like a maniac, as she put it. All for the hopes of a few more chances to race. Not the routine of a senior who had checked out. And it paid off. She ran at the Big East championship meet and scored her only collegiate victory at her final race —at Grand Valley State — before coming home to Falls Church with physiological momentum but emotional uncertainty. Desperate to break out of her malaise, wanting to run fast but shy of putting herself out there again, she considered transitioning to running for fun, maybe picking up ballet and French classes, but she couldn’t see herself putting running too deeply into the background. “I love running more than anything in the world,” she said. “I thought that maybe, when running is just fun, when there are no expectations, it would stop being so frustrating,” she said. Soon after coming home, she joined the Capital Area Runners and found coach George Buckheit’s approach to be exactly what she needed. Buckheit also saw what the problem was, and how her spring led her on the way to fixing it. Her first summer, she committed to building an aerobic base, one she found herself missing when she tried frantically to catch up following collegiate injuries. Within her first few weeks, Sullivan was cashing in that time she banked in the pool and on the treadmill, taking off immediately in her new training environment. All the while, she’s been spending her days on her feet as a kindergarten teacher in Fairfax County. “I love early brain development and it’s really cool to watch the kids put it together, make the little connections and see them become big connections,” she said. Sullivan has put a few things together, too. Her first half marathon — the 2012 Rock ‘n’ Roll Philadelphia Half — was long enough to seem like a challenge, but her sub 1:20 time convinced her, and Buckheit, that she had an aptitude for long distances. Over the next year, she set PRs in every distance and became a regular on local podiums. During her return to Philly in 2013, she took a swing at the Olympic Marathon Trials B standard half marathon time of 1:15. A side stitch in the last mile kept her from closing, but in the process she topped local Olympic 5k runner Julie Culley and marathon trials qualifier Christine Ramsey. From there, she focused on Shamrock, in March 2014, set on solving that last mile and earning her ticket to the trials. Memories of rough half marathons before dogged her, but she was fortunate to miss the savage ocean wings that plagued marathoners later that morning. Ahead of Cherry Blossom, Buckheit told her not to be surprised if she was running her 10k pace. When Sullivan found the pack of Americans chasing eventual champion Janet Bawcom and Sara Hall, she thought it “was cool to be racing with these women who were pretty good,” including national-class runners Frances Koons, Brianne Nelson and three-time Olympian Jen Rhines. Though she lost to Koons in a kick, she finished ahead of Nelson and Rhines, and probably made the difference between fourth place and farther back in the pack. “George told me to be brave, and that’s been the theme the past month — getting in and rolling with girls I don’t think I can race with,” she said. Now she sets her sights on the big one—the marathon. She’s going to try it out before the Olympic Trials, and plans on October’s Twin Cities Marathon. As she advanced her mileage, she scratched 95 miles a week earlier in the year, to see how her body reacted and give her a preview of training for 26.2 miles. This story originally appeared in the May/June 2014 RunWashington.